Take a moment and head on over to read it. Thanks to Linda. 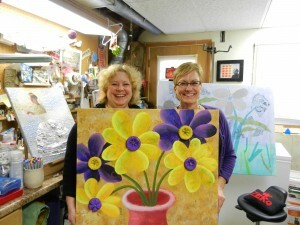 She is helping me share the stories of some incredible women who are proudly proclaiming to be a creative Late Bloomer. If you are a creative Late Bloomer I'd be honored to share your story, too. This painting is by Linda. Linda Kinnaman regularly posts 3 times a week ~ she has Mixed Media Mondays + Wet Paint Wednesdays + Fighting Fear Fridays. Each post is a good read and I always leave with a smile or something to apply to my life. Congrats Teresa! Love the picture you are holding and the smiles you both have! Thanks, Robyn. When that photo was taken we were actually laughing. The artwork is by Linda. I loved it!